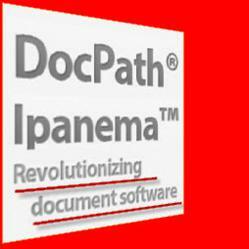 DocPath Ipanema Technology, the core technology of DocPath´s document management solutions, brings document management within the reach of all types of users and companies. DocPath has added a wide range of improvements to its document management solutions powered by Ipanema Technology, the new technological core. These enhancements intend to further increase the overall ease of use, efficiency and performance of DocPath software. The main goal of DocPath document management software driven by Ipanema Technology is to bring the tasks related to the design, management and generation of documents within the reach of all types of users. As such, DocPath has made sure to provide its latest solutions with visual, user-friendly and appealing interfaces, as well as a functional document design environment. Another noteworthy feature of DocPath´s software is how the flow of the document process is laid out. Instead of having to perform complicated actions, or even having to program the entire process, users simply visually define the process flow by dragging and dropping the elements into the correct position. The latest enhancements added to DocPath´s document management solutions are mainly geared towards further optimization of the software to ensure full performance on any operating system, whether it be Windows, Unix, IBM i, or any another system. Moreover, the document generation modules provided with the latest software run natively on a client´s system. This means that users do not need to give up the working environment they´re familiar with to generate documents in a more efficient, rapid and straighforward manner. Additionally, DocPath has also focused on the visual elements of its latest document management solutions. After all, user interfaces are the principal means of communication between user and program. “The truth is that, as systems are becoming more and more complex, designing well laid-out interfaces that distance users from the complex reality behind the programs, is also turning into an increasingly difficult challenge,” says Julio Olivares, DocPath President and founder. For more information about DocPath Ipanema Technology, visit http://www.docpath.com, or watch the video describing the main features of DocPath solutions driven by Ipanema Technology. DocPath is a leading document management software manufacturer. Founded in 1992, its headquarters is located in Madrid, Spain, with two other design and development offices. DocPath solutions are found in companies all over the world. Among its international clients are prestigious banks and first-class corporations, which are aided by DocPath solutions by simplifying the complicated and critical tasks involving design and the distribution of documents. DocPath maintains a strong commitment to R&D&i, an area that receives a good amount of its revenue, and in which lies the key to the company´s success. For more information, visit http://www.docpath.com. DocPath is a registered trademark of DocPath Corp. All rights reserved. Other trademarks may be the property of their respective owners..